Ian Heywood, Sarah Cornelius, Steve Carver. 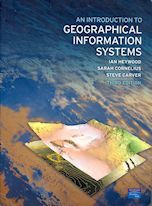 An Introduction to Geographical Information Systems: 3rd edn. The third edition of this highly regarded and successful text continues to provide a clear and accessible introduction to the world of GIS for students and professionals. With an increased focus on the practical applications of GIS, this edition features a wealth of new multi-disciplinary case studies and examples of GIS in practice, demonstrating how it is used worldwide and within a variety of different industries. Furthermore, the third edition has been substantially revised and updated to include coverage of the latest advances in GIS such as location-based services, time-based GIS, web mapping, data supply and 3D visualization.